SkillOnNet’s Space Arcade Slot pays tribute to the classic days of arcade games. The slot contains retro graphics and sound effects. Spin the reels and colorful alien spacecrafts swirl across the reels. This slot keeps things simple, making it easy to understand payouts and game rules. 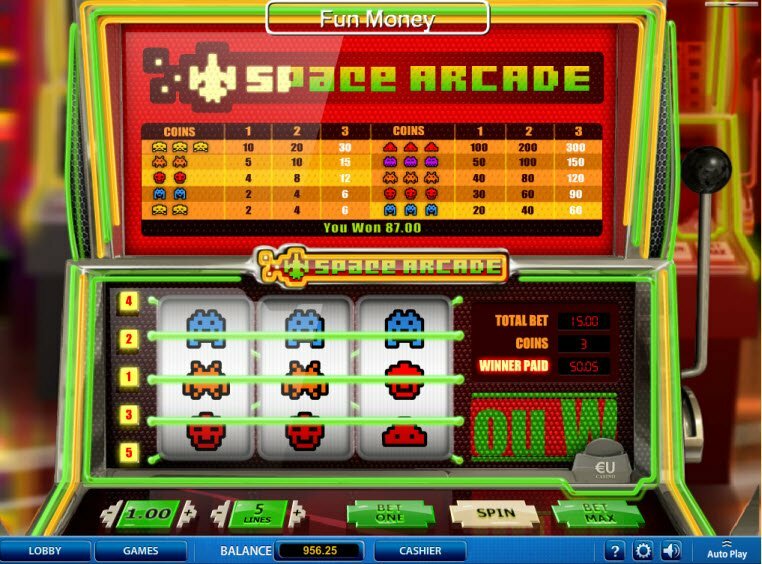 The Space Arcade Slot definitely represents one of the better classic slot machines available online. Jump in your space ship and transport back to the glory days of arcade games. The Space Arcade Slot recreates the classic slot with its retro look and feel. The game includes 3 reels and 5 paylines decorated with neon lights and pixilated extraterrestrials. The Space Arcade Slot revisits the glory days of arcade gaming. Graphics may not appear super sophisticated or modern, but they’re not supposed to be! This game pays homage to the early days of classic arcade games with its overly pixilated images, neon lights, and 8-bit soundtrack. Space ships and Aliens line up and award payouts. During winning payouts, the slot machine flashes with colorful bright lights. This game pays homage to the early days of classic arcade games with its overly pixilated images, neon lights, and 8-bit soundtrack. So the Space Arcade Slot bonuses don't have over the top game features such as Expanding Wilds, Scatters, Bonus Games, or Double Up Rounds. Instead, Space Arcade keeps it simple. Combinations of two of three of kind award different payouts depending on the payline. 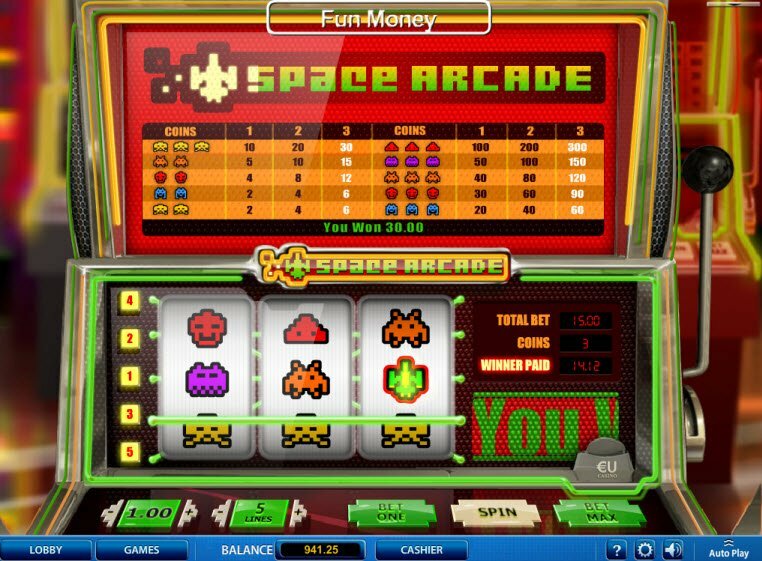 Altogether the game includes 5 paylines with 5 different space ship images. Spin the reels for your chance to hit matching combinations and win.